Inflammatory response, computer artwork. Inflammation is the first response of the immune system to infection or irritation. Here bacteria (gold) are seen entering the body through a cut in the skin. 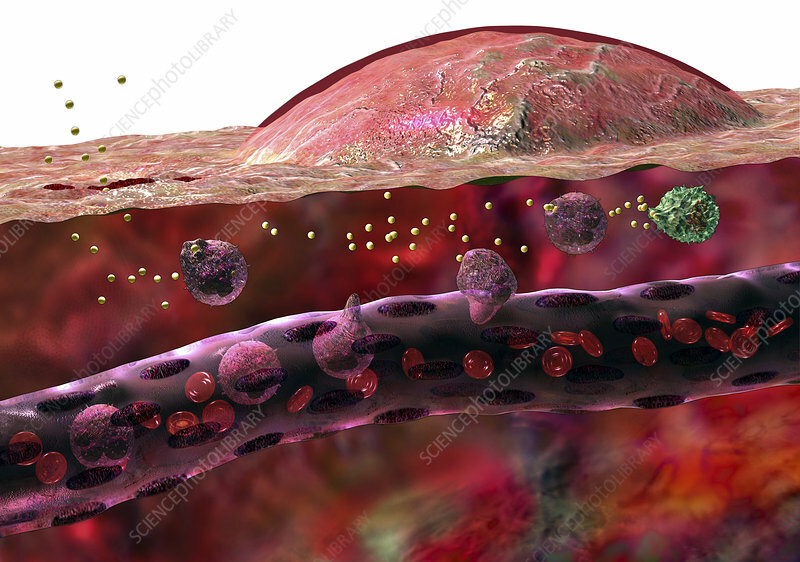 The capillary beneath the entry site is releasing neutrophil (purple) and macrophage (green) cells into the tissue. As part of the response the capillary will dilate, increasing blood flow to the area and causing redness, swelling and warming of the area. Neutrophils and macrophages phagocytose (engulf) the bacteria and also release chemicals that attract and activate other immune cells.